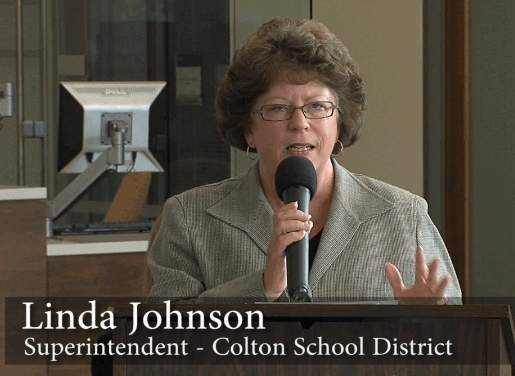 “This is going to open the world to Colton,” said Colton School District Superintendent Linda Johnson, speaking at a September 2010 kick-off event for the Clackamas County (Oregon) Technology Services BTOP project. She went on to present a convincing portrayal of how expanded broadband access will change learning in Colton’s small, rural school district. According to Ms. Jackson, the school district tried for several years to increase the available bandwidth and each time was stopped by the cost. Ms. Jackson explained that every school district in the county except Colton had access to educational resources that required high bandwidth. She described this as a handicap to both teachers and students, especially as the schools try to teach 21st century knowledge and skills. •	High-quality video conferencing across the school district, the county, and the state. •	Reliable connectivity to support day-to-day activities such as standards-based testing. •	Cost savings through enhanced use of shared resources. •	Ability to streamline video into classrooms and libraries. The event included tours of Clackamas Community College to demonstrate how broadband will enhance technology offerings in the county.